Attendees to the 2014 IWLA Convention & Expo, March 23-25, in Phoenix, Ariz., have a lot to look forward to in the coming weeks. One highlight is a new app, designed to enhance user engagement throughout the event. 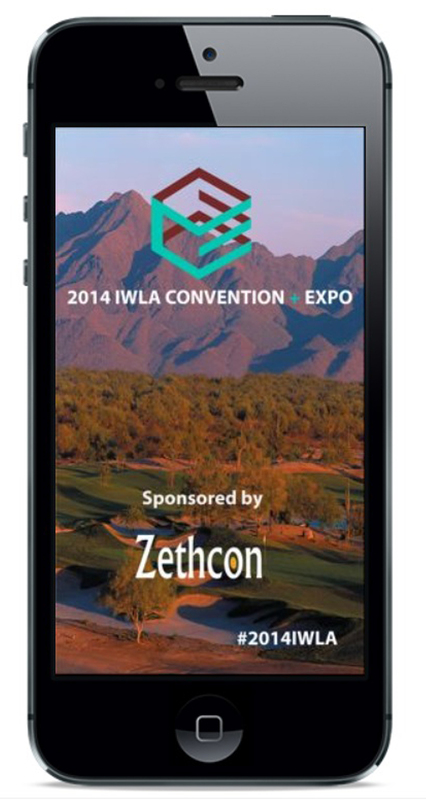 Zethcon returns as the 2014 IWLA App sponsor. The event-based app provides attendees with a single source of information on all activities, functions, attendees, presentations and exhibitors, all at your fingertips through your mobile device or tablet. Similar to a program guide, the app gives you the tools to review the program/speakers and create your own agenda based on your unique interests. The upgraded technology allows you to push that agenda to your calendar. Networking with other attendees and partners is a huge component to the IWLA Convention & Expo. The app extends face-to-face interactions further, allowing you to visit profiles, follow and view activity feeds during the event. The app encourages engagement from attendees, speakers and exhibitors by providing status updates in the activity feed and check-ins when arriving at sessions and receptions. Guests can document the experience by posting photos through the app photo feed to build memories long after the event is over. No app would be complete without an opportunity to win prizes. The IWLA Convention & Expo Badge Dash app-based game is your ticket to getting the most from your 2014 experience. Nearly every action taken within the app has a point value assigned to it. As users post, comment, rate sessions, take surveys or check-in to exhibitors booths through the QR code scanner they will accumulate points. Users can track each other’s point values through the app leader board. By the end of the event, the top leader board earners will enter into a drawing for the Top IWLA Convention & Expo App Leader Board prize. As you attend IWLA Convention functions and receptions you will notice QR codes placed throughout the event. Scan the QR code with the built-in app-scanner to unlock badges. The top badge earners will also be awarded the Top IWLA Convention & Expo App Badge prize. Winners will be recognized during the IWLA Chairman’s Dinner & Reception. To download the app search for “2014 IWLA” in your mobile service provider’s app store. The username is the IWLA Convention attendee’s email address. The password is “2014IWLA.” Only registered attendees, speakers, sponsors and exhibitors will have access to the app. Not registered for the 2014 IWLA Convention & Expo yet? Register for the March 23-25 event. Exhibitors and sponsors have expanded opportunities to engage attendees through the app—to learn more about promoted posts and push notifications contact IWLA at convention@IWLA.com.